Scottish Liberal Democrat deputy leader Alistair Carmichael has lodged a Bill in the House of Commons calling for Scottish banknotes to be accepted throughout the UK. Mr Carmichael will present his Legal Tender (Scottish Banknotes) Bill to Parliament as he bids to encourage businesses across the United Kingdom to recognise and accept Scottish banknotes. While Scottish banknotes may be accepted in England, they do not carry the status of legal tender. The Lib Dems say the Bill would enhance the status of Scottish banknotes and mean a distinction couldn’t be made between these and other banknotes issued in the UK when accepting them as payment. 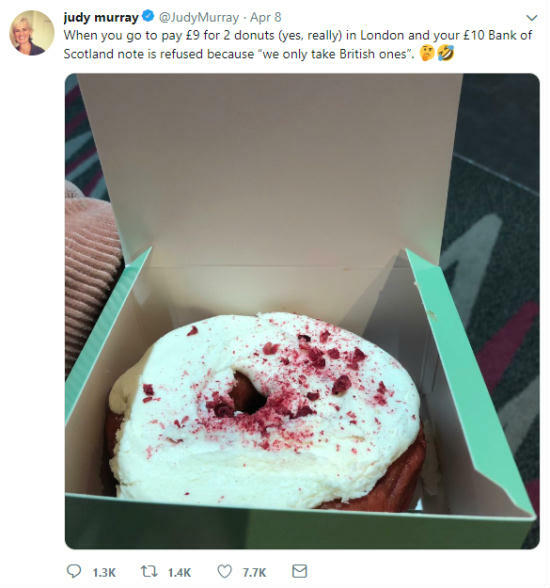 The latest in a long line of refusal incidents happened this week after tennis coach Judy Murray tweeted about how her Scottish notes had just been turned down by a bakery in London when she was trying to buy doughnuts because they “only take British” banknotes. Presenting his Bill this week, Mr Carmichael said: “Every Scot who travels south has a story about their money being turned down or looked at sceptically. “There is no reason to make a distinction between Scottish and other banknotes as acceptable payment. Its beyond time we give legal force to the well-known phrase ‘that’s legal tender pal’.